It’s been so hot lately, coming home to an ice cold homemade kombucha has been heaven. I make my own kombucha at home, which is quite easy to do. You just have to wait about a month initially until it’s ready. One of our favorite kombucha flavors to make is grape. It very much reminds you of Grape Fanta if you had it as a kid. No matter how much I divide the kombucha base flavoring into different flavors, I always make my trusty grape flavor. Growing up I loved floats. It was a treat when my Mom let me have it at restaurants. 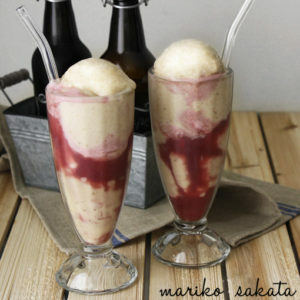 The creamy ice cream melting against the bubbly melon soda (Yes, that’s a thing in Japan. It’s called “cream soda”.) or Coke was pure bliss, even for someone like me without a sweet tooth. I was sipping on my ice cold, bubbly, homemade kombucha recently and had the brilliant idea of adding some banana ice cream (a.k.a “Nice Cream”) into my glass. And BAM!!! There it was, a kombucha float! Icy, creamy, bubbly, oh so good! Where was this all my life! A fantastic healthy alternative to traditional floats. Making your own raw vegan kombucha banana ice cream float is pretty easy. Choose a store bought or homemade kombucha flavor that will go well with the banana ice cream. I used my favorite grape flavor for this, but orange, mangos, berries, any flavors would work. The sky is the limit! Be sure to have your kombucha chilled. Now that you have your kombucha ready to go, you just have to whip up some banana ice cream. Place the frozen bananas in the blender, and blend until it becomes a smooth creamy texture, like a soft serve. If you have a Vitamix, use the tamper to jam the bananas into the blade to help it blend. If you don’t have a high speed blender like Vitamix or Blendtec, you can use the food processor instead. But be sure to cut up the bananas into smaller pieces before you freeze them, to make it easier for the food processor. 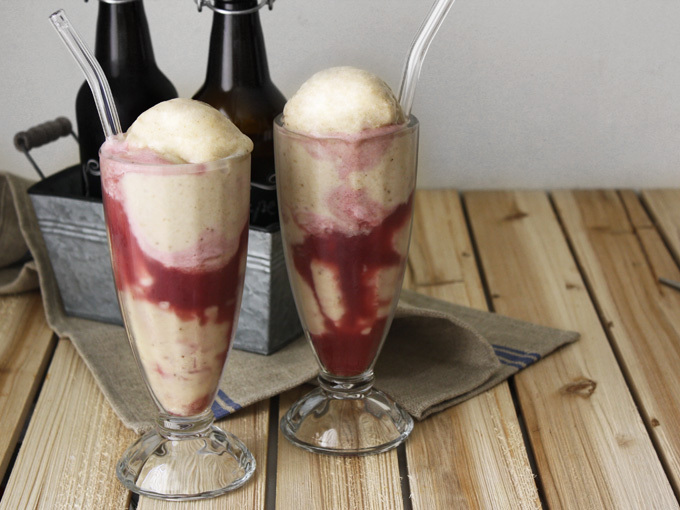 Scoop some banana ice cream into the glass and pour in your choice of chilled kombucha. Top it off with a nice scoop of banana ice cream and you are all set! Bubbly creamy goodness! Happy sipping! 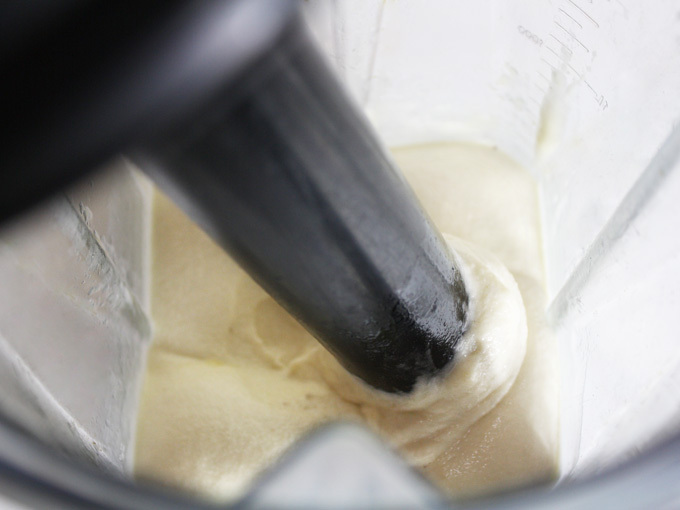 Place the frozen bananas in the blender, and blend until it becomes a smooth creamy texture, like a soft serve. If you have a Vitamix, use the tamper to jam the bananas into the blade to help it blend. If you don't have a high speed blender like Vitamix or Blendtec, you can use the food processor instead. But be sure to cut up the bananas into smaller pieces before you freeze them, to make it easier for the food processor. 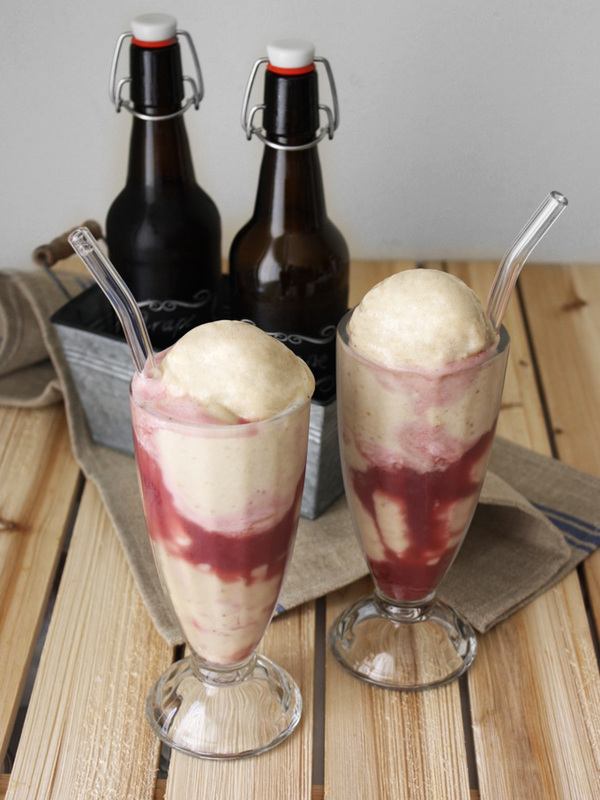 Scoop the banana ice cream into the glass and pour in your choice of chilled kombucha. Top it off with another scoop of banana ice cream and serve. How do you make grape or fruit kambucha? Thank you for your comment! Do you already make your own kombucha? If you do, then when you flavor the kombucha during the second fermentation phase, you use grape juice to flavor it. For fruit kombucha, you can use fruit puree or fruit juice of your choice to flavor. Then seal the lid tight and let it ferment for another 10-20 days until it reaches your desired flavor. Keep away from direct sunlight and once it’s done, store it in the fridge and it’s ready to serve.